The IAB released its first mobile ad spend study this week, which shows that the UK market grew by 99.2% year on year, and was worth a total of £28.6m in 2008. What are the main reasons for this growth? Consumers have changed their behavior on mobiles over the last year or so, and this is thanks to better handsets; there has been a 36% year on year increase in 3G handset penetration. The iPhone and other smartphones have had a massive influence. The growth in the use of such phones means that mobile users are now doing much more on the mobile internet than they used to. Mobile internet content has improved a lot, giving users more reasons to go online. This is especially true of social networks, which are now growing much faster on mobile. Social network usage on mobile grew by 179% last year, compare with 10% on the rest of the internet. This is from a smaller base than general web use, but is still massive growth. The increased use of unlimited mobile internet ‘all you can eat’ tariffs. The number of mobile users with this type of price plan has grown by 109%. This means that, while it was relatively static for a while, mobile internet was up 30% in 2008. Are advertisers also starting to pay more attention to mobile? Yes, agencies are now starting to take mobile advertising more seriously than before, and many now have dedicated mobile experts. Is there much resistance to mobile ads from users? Not really. In fact, most research points the other way, and shows that mobile users actually like advertising. Firstly, the mobile industry has been very cautious about rolling out mobile ads, and has been making sure that they avoid intrusive ad formats. This means that most mobile users’ experience of advertising has been a good one. Secondly, ads are being used to fund content, so customers are happy to make this trade off. One obvious example of this is Blyk, which has achieved some outstanding results in terms of conversions. Is the audience for mobile ads younger than online? It is predominantly the 16-34 age range, and also skewed towards males. However, this is beginning to spread out and will eventually become more like that of general web users. What are the most popular ad formats? There is an almost even spread between search and display ads. Within display, 82% of mobile ads are banners and text links. Are brands / advertisers doing more to integrate mobile campaigns with other channels? Without a doubt, the best use is made of mobile advertising when campaigns are properly integrated into other channels. For example, Nike’s Boot Camp campaign used mobile very creatively as part of the mix, providing training aids such as bleep tests to users through their mobiles. Swiftcover’s mobile quote service is another example; users could get a car insurance quote very quickly on their phones. This reduced the time taken to get a quote, and had some good results; conversion rates were higher on mobile than the mobile. Do you expect to see more advertiser offering customers the option making payments on mobile after clicking on ads, rather than just using mobile ads for data capture, click to call etc? It is now getting easier for brands to include payments on their sites, though not many retailers have done this yet. There are other options though; mobile users can make payments which are then taken out of their monthly phone bill, though this has only been used for small transactions. In theory, it is easier to pay with a mobile in this way than anything else. How much impact has the iPhone had? Undoubtedly, a massive impact, though it’s important to remember that the iPhone only accounts for 1.7% of handsets in the UK. It has had a disproportionate effect on mobile internet usage though, and iPhone users do a lot more online that people with other handsets. For instance, 81% of iPhone users look for news and information daily, compared with the overall average of 11%. Other phones are still significant though; N95 users also use the mobile internet a lot more than the average. Do you expect this growth to continue into the future? It’s difficult to say how much growth there will be this year. While online advertising in general is predicted to grow at around 10%, most analysts are predicting growth for mobile, but it is hard to put a figure on it, though there is plenty of optimism around it. Has the recession had much of an impact on growth? Mobile ad spend grew every quarter through 2008, so the recession doesn’t seem to have stopped the growth. Apple’s response to netbooks: a tablet? the Mac brand on, quite frankly“. That’s fine, but the reality is that netbooks have made a huge mark on the market and have been given credit for driving much of the growth in the PC market. It’s not hard to see why: for $300 or less in some cases, consumers can have an internet-capable ‘mini-laptop‘. In this economy, it’s safe to say that many netbooks have been sold to consumers who otherwise would not have made a laptop purchase due to price considerations. Large advertising budgets can be a boon to companies looking to spread the word about their products, but they’re not always neccessary. This spring, a Puerto Rican-based taco chain found that a combination radio and mobile campaign increased sales by 21%. The campaign, which cost under $50,000, focused on spreading word of mouth about the brand and getting people into the stores by offering free burritos via SMS. well as brand extension out of the iPhone’s lucrative app store. 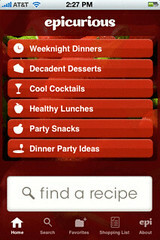 Last week, People.com launched an iPhone app for $1.99 and other publishers are announcing plans to follow suit shortly.